Combines compounds that help build and maintain cartilage tissue (chondroitin, glucosamine, MSM…). Designed to relieve the pain and symptoms of arthritis. Contains ingredients that help slow down the development of arthritis. The dietary supplement Joint Support Formula has been specially formulated to optimise joint health, drawing on a wide body of scientific research. In particular, it incorporates glucosamine and chondroitin, two natural-source substances which several meta-analyses have confirmed to be effective at relieving the symptoms of arthritis1-5. Despite what you might think, glucosamine is not a molecule created entirely by the pharmaceutical industry: it is naturally produced by the body from glutamine and glucose. It plays a fundamental role in maintaining the integrity of the joints, particularly cartilage. We now know that when this process of producing glucosamine goes awry, cartilage degenerates and arthritis develops. That is why it is one of the most widely-studied natural substances in relation to arthritis: thousands of studies have been published on the subject with the vast majority of meta-analyses confirming its efficacy for the relief of arthritis1-5. Some of them even suggest it can help inhibit development of the disease, unlike NSAID-type painkillers which tend to aggravate the process. It’s not for nothing then that the Osteoarthritis Research Society International (OARSI) counts glucosamine among the treatments it considers potentially helpful to arthritis sufferers. It is included in Joint Support Formula in the form of glucosamine sulphate (the form most highly-rated by studies) from marine sources (the shells of certain crustaceans). A close second to glucosamine is chondroitin, another molecule naturally produced by the body with well-documented efficacy6-9. It’s an essential constituent of cartilage which helps ensure it retains water and maintains the elasticity, firmness and suppleness of the joints. Like glucosamine, it is recognised for relieving the pain of arthritis: it’s thought to help fight inflammation and promote the reconstruction of cartilage by inhibiting hyaluronidase, the enzyme which destroys it, and osteoclasts, cells that contribute to loss of bone substance. The chondroitin in Joint Support Formula, is of marine origin whereas the majority of supplements use bovine or porcine cartilage. As absorption rates are somewhat low, supplements that contain less than 800mg per daily dose should be avoided (Joint Support Formula contains 1200 mg). 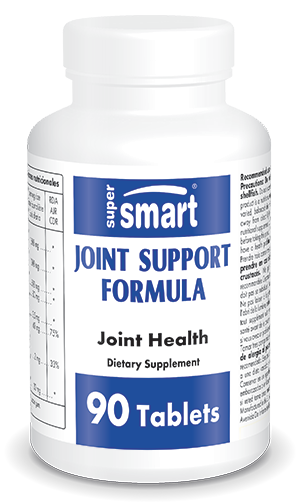 Joint Support Formulahyaluronic acid may also offer benefits for joint health. Its ability to bind and retain more than 500 times its weight in water is particularly interesting as it may enable it to play a cushioning and lubricating role in cartilage and thus potentially reduce friction between bones. This mechanism is clearly one of the most credible explanations for its apparent analgesic effect. The formulation also contains boron (2.5 mg per dose), a trace element involved in a number of physiological processes including bone development and calcium metabolism. While the scientific consensus is not total, a number of researchers have shown incidence of arthritis to be higher among people consuming less than 1mg of boron a day. Evidence also suggests that arthritis sufferers always have lower boron levels (in the bones and synovial fluid) than healthy individuals. These two associations have led some scientists to recommend the consumption of 3-6mg of boron a day (found in small quantities in nuts, pulses, fruit and vegetables) for preventing and treating arthritis. The last of the three active principles included in Joint Support Formula is methylsulfonylmethane (MSM) , a sulfur-containing compound found in very small amounts in a number of foods (fruits and vegetables, seaweed, seafood and meat). For some time, MSM too has been thought to reduce the pain of arthritis (by promoting joint comfort), with a number of studies demonstrating its efficacy, at least in the short-term11. Several books have been written about this supplement but the theories advanced to explain its effects remain unproven: the most plausible is based on its high content of sulphur-containing compounds. To top it off, the creators of Joint Support Formula have thought to include three extra compounds: vitamin C the antioxidant and anti-inflammatory effects of which are well-established, manganese, an essential nutrient for bone formation, and silicon, a chemical element found in certain plants (in this case, Bambusa vulgaris) which may have a positive effect on those suffering from joint problems. This is therefore a formulation that combines a selection of ingredients which are among the most widely-studied or which offer potential in improving the health of the joints. Used for relieving pain, it offers a credible alternative to NSAIDs, the side-effects of which are increasingly apparent. It is aimed at individuals with joint problems, particular those with arthritis: the dose can be adjusted according to the degree of pain felt, but should not exceed three tablets a day. Other innovative formulations are also available for relieving joint pain. One such supplement contains bone morphogenetic proteins which are involved in joint and bone regeneration, while the formulation UC-II® offers the only patented form of undenatured type II collagen. There’s also an improved form of methylsulfonylmethane (MSM), one of the most extensively-studied molecules in the area of joint health. 3. Evaluation of symptomatic slow-acting drugs in osteoarthritis using the GRADE system. Bruyère O, Burlet N, et al. BMC Musculoskelet Disord. 2008 Dec 16;9:165. 5. The clinical effectiveness of glucosamine and chondroitin supplements in slowing or arresting progression of osteoarthritis of the knee: a systematic review and economic evaluation. Black C, Clar C, Henderson R et al. Health Technol Assess. 2009 Nov;13(52):1-148. Review. 6. Richy F, Bruyere O, et al. Structural and symptomatic efficacy of glucosamine and chondroitin in knee osteoarthritis: a comprehensive meta-analysis. Arch Intern Med. 2003 Jul 14;163(13):1514-22. 7. Uebelhart D. Clinical review of chondroitin sulfate in osteoarthritis. Osteoarthritis Cartilage. 2008;16 Suppl 3:S19-21. Review. 8. Lamari FN. The potential of chondroitin sulfate as a therapeutic agent. Connect Tissue Res. 2008;49(3):289-92. Review. 9. Monfort J, Martel-Pelletier J, Pelletier JP. Chondroitin sulphate for symptomatic osteoarthritis: critical appraisal of meta-analyses. Curr Med Res Opin. 2008 May;24(5):1303-8. Review. Review. 10. Newnham RE. Essentiality of boron for healthy bones and joints.Environ Health Perspect 1994 Nov;102 Suppl 7:83-5. 11. Xie Q, Shi R, et al. Effects of AR7 Joint Complex on arthralgia for patients with osteoarthritis: results of a three-month study in Shanghai, China. Nutr J. 2008 Oct 27; 7:31. Take three tablets a day. Caution : do not take if allergic to fish or shellfish.